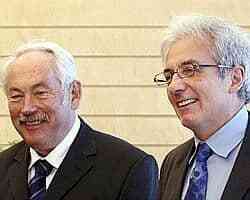 Peter Gruenberg (L) of Germany and Albert Fert of France pose in Tokyo in this 18 April 2007 file picture. Stockholm: Albert Fert of France and Peter Gruenberg of Germany on Tuesday won the Nobel Prize in physics for their pioneering work that led to the miniaturised hard disk, one of the breakthroughs of modern information technology. Fert, 69 and Gruenberg, 68, were lauded for their discovery in 1988 of a principle called giant magnetoresistance, or GMR. The two scientists’ discovery of how magnetism affects electrical resistance led directly to the tiny hard drives in devices such as the iPod and MP3. The first read-out head based on Fert and Gruenberg’s technology was launched in 1997, and has been the standard in industry since then. Working independently, Fert and Gruenberg discovered that minute magnetic changes, in materials made of very thin layers of various metallic elements, lead to huge differences in electrical resistance. In turn, these differences lead to changes in the current in the read-out head, which scans a hard disk to spot the ones and zeroes in which the data is stored. As a result, the read-out head is able to read smaller and weaker magnetic areas—and this sensitivity means information can be packed more densely on the hard disk. Meanwhile, the chemistry prize will be announced on Wednesday and the literature prize on Thursday. The prestigious peace prize will be announced on Friday and the economics prize on Monday.